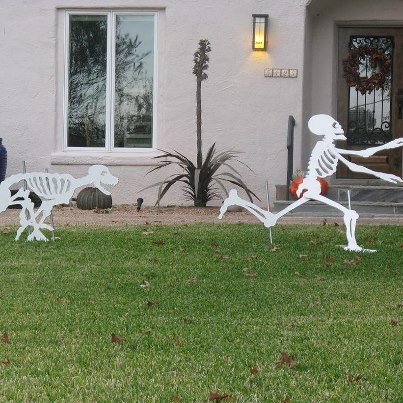 Heidi Ganahl the CEO of Camp Bow Wow offers the following safety tips for Halloween. Fido may look adorable in his new superhero costume, but that cape won’t necessarily keep him out of harm’s way. Dressing up your pet for Halloween can be harmful. Costumes should not constrict the animal’s movement, hearing or sight, or impede their ability to breathe, bark or meow. Also, it may be helpful to try on costumes before the big night. If your pet seems distressed or shows abnormal behavior, don’t bother. Before your pet participates in any Halloween activities, take a closer look at his or her costume and make sure it does not have small, dangling or easily chewed-off pieces that they could choke on. Also, watch out for ill-fitting outfits which can get twisted on external objects on your pet, leading to injury. Putting make-up or face paint on your pet can be harmful. Paints could potentially irritate their skin, or may be eaten. Even make-up that is non-toxic could cause stomachaches or worse. Candy bags are strictly for the enjoyment of trick-or-treaters, not your pet. Chocolate in all forms, especially dark or baking chocolate, can be very dangerous for dogs and cats. Give your pooch their own Halloween candy by treating them to their favorite doggy snack. If you do suspect that your pet has ingested something toxic, please call your veterinarian or your local control center immediately. Keep an eye out for decorative edible items like Halloween pumpkins and candy corn, when participating in this year’s festivities with your pet. While these are considered to be relatively nontoxic, they can be harmful, causing stomach upset in pets who nibble on them. Do not take your pets trick or treating. It’s possible that your dog could get spooked by a ghost or goblin and a dog bite or fight could occur. Happy & Safe Halloween to All! Yes, we think the answer to that question is definitely a yes! Cruising along through one of social media’s popular sites, we saw this cool image which immediately sparked the idea for a short article on window bird feeders. Along with a recent email from a friend who had just started feeding hummingbirds in her Golden, Co town (and she lives on the 4th floor) – we knew that yes, there are birds who visit balconies to find food or shelter. 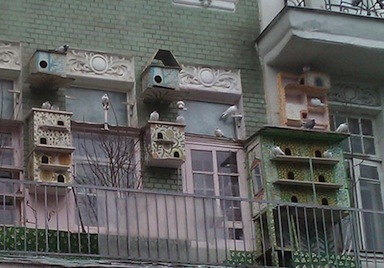 Now maybe these are just some city-dwelling pigeons shown here, but the bird homes sure are neat looking. The trick might be to first offer something substantial that birds will see. Maybe something hanging near the ledge, like a birdbath with fresh water, or a suet feeder… something that won’t leave any mess below for neighbors 🙂 They’ll appreciate that too! Keeping a simple saucer of fresh water available at all times may even lure birds to your balcony. Once birds are familiar with an offering, place a feeder on the window, or glass sliding door. Obviously, it would do best on the stationary door that doesn’t open. Like that famous saying… “if you build it-they will come”. Window feeders are available in all shapes, sizes and varieties too; for nectar, seed, suet, mealworms, fruit and nuts, the secret is letting birds know you’ve got the goods! And the best news with feeders placed on balconies… no squirrels like the typical backyard. Even if you reside say on the seventh floor, there’s no reason you can’t enjoy the wonderful antics of feathered friends! 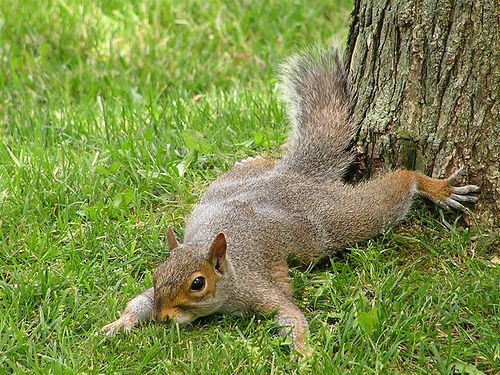 As long as there’s food being offered for birds… there are pesky squirrels trying to get their fair share! And more than their share at that, little pigs can consume their own body weight in less than one week. It’s so frustrating in fact, some folks just give up on feeding their birds. 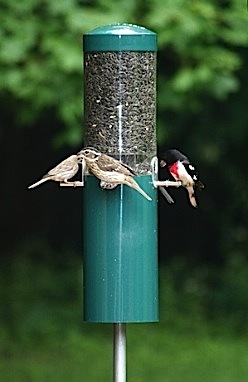 With the correct feeder, it doesn’t have to be this way at all. Should squirrels be a real nuisance around your place, and everything you’ve tried in the past doesn’t seem to work, a bird feeder with a built-in squirrel baffle may just be the answer. Some companies who manufacture these are experts in the field… no pun intended. Designs have been tested and perfected over the years to thwart shenanigans of the most clever critters. Arundale, BirdsChoice, and Squirrel Buster are just a few. They pretty much guarantee that squirrels won’t get past the baffles that are incorporated into their designs. Available in both hanging and pole-mounted styles, these high quality bird feeders will last for many seasons of squirrel-free enjoyment. Some of the designs have been around for years, with proven track records of success. 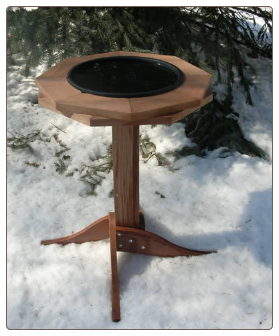 Save yourself birdseed, money and aggravation with a quality bird feeder that already includes a squirrel baffle… you birds will thank you too! Maybe this has nothing to do with birds, but due to the nature of animals involved, it’s a subject near and dear to our hearts. Because we follow them on Twitter, The US Fish and Wildlife Service sent an email they were “back on the job” now that the shut-down is over. To us – it’s not such great news, nor to wild horses, nor wolves, nor anything else that gets in the way of big money interests! Their PR department and spin doctors do a fantastic job in having folks believe their mission is to protect animals… it’s the furthest thing from the truth! 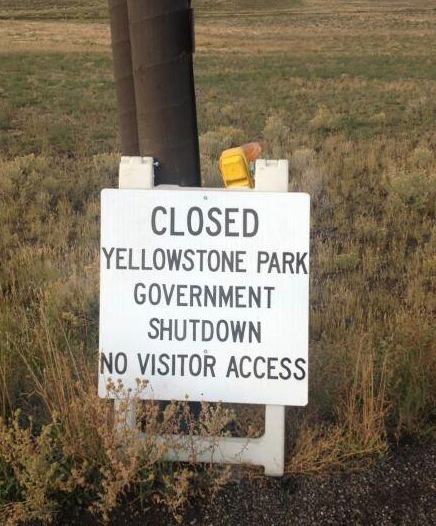 Even while furloughed, the shady practices continued. Below is an update from The American Wild Horse Preservation, who follows closely (and tries to rescue) the unfortunate horses who are claimed by our Bureau of Land Management and/or our USFWS. How maddening… and our tax dollars fund this! The Sheldon National Wildlife Refuge in Nevada used the government shutdown as an excuse to cancel public observation of the pens where 413 recently-captured wild horses were being held, but it did not stop Refuge officials from recalling furloughed workers to process and ship as many as 250 wild horses to slaughter middleman Stan Palmer (pictured left) in Mississippi. These horses were unnecessarily rounded up in September. Sadly, since they live on land managed by the U.S. Fish and Wildlife Service, they are not protected by the federal law that protects wild horses and burros on Forest Service and Bureau of Land Management (BLM) lands. 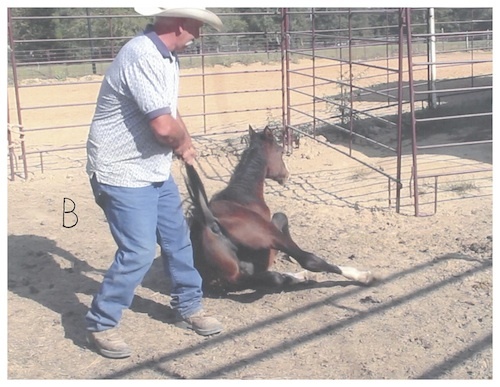 Our efforts continue to hold Interior Secretary Sally Jewell accountable for dumping these horses into the slaughter pipeline, and to track the fate of the horses so callously sent to Mississippi. For more information please click here … we will continue to keep you updated on this disturbing and evolving situation. We won’t let the Interior Department get away with this and just sweep it under the rug. Stay tuned for future actions on this issue. This question appeared in our in box today. We thought the response might be useful to others who cant seem to attract nesting birds. Although they say not to crowd houses together, chickadees will usually nest in hanging houses that are in close proximity to each other… mine seem to anyway! Not sure how large the tree is, but maybe one nest box on each side would do the trick? Nesting season is through for this year, but your chickadees (or other birds) may use the house for roosting on cold nights. Not much success with my cotton nesting ball either, I think they’re woven too tightly! A better mix is using decorative mosses (Spanish and sphagnum sheet moss) feathers, and pet hair if you have access. You can pick apart the nest ball as well and add this material to the mix. Put these in a standard suet cage, or mesh produce bag from the grocery store. Don’t pack too tightly, so that air can flow through and allow for drying after rain. Hang from a branch where birds will see it. Early spring is the best time to offer the materials… before nesting begins. You can try adding some dried grass clippings to your house, in hopes of enticing chickadees to roost. They will hang around for the winter, especially if you’re feeding them. Offering fresh water is the absolute best way to keep birds around, even if it’s just a plant saucer… keep the water fresh and they will come! 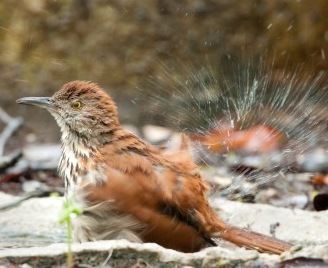 Not sure where you’re located, but heated bird baths in winter are truly a God-send for birds! They need to bathe in order for feathers to work properly! Also, if the cats are outdoors, they may be inhibiting chickadees’ desire to nest, simply because they’re uncomfortable seeing the cats in the yard. Hope this helps… I think there’s a new blog post here! Thanks again & happy birding! Is That Animal Attraction Really Eco? NEW YORK CITY – October 14, 2013 – In recent years, eco-tourism has become a hot buzzword for environmentally minded travelers, but the World Society for the Protection of Animals (WSPA) advises tourists to research visitor attractions to ensure they are operating responsibly, keeping in mind the welfare of animals and the environment, and avoid those that are simply greenwashing. Using the Cayman Turtle Farm as an example, Elizabeth Hogan, oceans and wildlife campaigns manager at WSPA, put together a list of five tips that can help tourists identify when an eco-tourist attraction is not as animal- or environmentally friendly as it claims. The turtle farm is a popular tourist destination in the Cayman Islands that alleges to focus on the conservation and the protection of endangered sea turtles, but also sells them for food and has a poor track record on animal protection issues. 1) Avoid direct interaction with the animals. As a general rule, you shouldn’t be touching animals at an eco-tourist attraction. Whether it’s swimming with dolphins or holding sea turtles, this kind of contact with hundreds or thousands of tourists can traumatize the very animals being protected and compromise their health, sometimes in serious ways. Be wary of any eco-tourist attraction that encourages or allows this kind of contact and know it may also pose a health risk for you personally. For example, at the Cayman Turtle Farm, tourists are encouraged to handle the sea turtles, putting themselves at risk of contracting E.coli and salmonella. 2) If there is a high entertainment to science ratio, stay away. Eco-tourist attractions must balance science and entertainment. Unfortunately, some lean too heavily on the latter. If the eco-tourist attraction you’re considering has too much entertainment, such as snorkelling with sea turtles in small artificial ponds as the case at the Cayman Turtle Farm, it may not be paying enough attention to welfare of the animals it’s supposedly protecting and the science of conservation. 3) Don’t eat any of the animals supposedly being protected. Done properly, there’s nothing wrong with farming. But it’s a very different thing than conservation. Any eco-tourist attraction that tries to balance conservation of a species with selling it for meat is caught in a conflict of interest. At the Cayman Turtle Farm, it claims to be helping endangered sea turtles while simultaneously selling sea turtle meat to local restaurants. 4) Look for what trusted third parties have to say. Before you visit an attraction, spend a few minutes on the Internet to see what trusted third-party groups have to say. In the case of the Cayman Turtle Farm, WSPA as well as other animal and conservation groups have expressed concerns about its policies and practices which are online and come up in any search on the farm. 5) Ask you travel agent, cruise line and hotel concierge lots of questions. With the four points above in mind, come armed with questions for anyone recommending you visit an eco-tourist attraction. Ask members of the travel industry to investigate the attractions they are promoting and provide proof that the property is operating with animal’s and the environment’s interest at its core. If they can’t answer all of your concerns, look for other animal- and eco-friendly options. In the case of the Cayman Turtle Farm, WSPA and other groups have met with and encouraged cruise lines visiting the Cayman Islands to stop directing tourists to the farm because of its poor track record with animal welfare issues. WSPA says keeping these five simple tips in mind will help environmentally minded travelers avoid eco-tourist attractions that fail to meet industry standards..
To learn more about WSPA’s campaign to end sea turtle cruelty at the Cayman Turtle Farm, visit http://www.StopSeaTurtleFarm.org. At the World Society for the Protection of Animals, we have worked to expose animal cruelty and prevent animal suffering for more than 30 years. Working with individuals, organizations and governments across the globe, our campaigns range from putting animals at the heart of farming to protecting animals in disasters. Consultative status with the United Nations means we have a unique international platform to prove that the lives of animals are inextricably linked to our own, and now more than ever is the time to stop their suffering. It doesn’t take a gigantic yard to have to have colorful birds visiting! Good ol’ H2O is the easiest, most cost-effective way to attract feathered friends to your place… even to your balcony, patio, porch, or small deck. 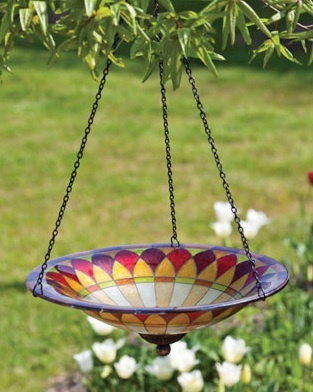 Adding a hanging bird bath may fit the bill for you – it certainly will for the birds! Vivid colors and fun designs abound for use as stylish decor to brighten up a boring area. They’re versatile for use as a feeder in frigid weather too, accommodating just about anything from seed mixes, to suet, to peanuts. Good stuff for birds in winter! The bath needn’t be monster size either, as we’ve seen birds perch and drink from tiny ant moats. So petite size bowls also work fabulously for offering fresh water. And that’s the trick – keeping the water fresh at all times. This unique stained glass and copper mini bath comes in six fun designs and is sure to attract some avian amigos to your place! It’s reasonably priced under $25 too. Lame post? Well maybe so, but this shut-down crap has us in a tizzy! Not only a detriment to the economy… it’s a huge disgrace as the US is now the laughing stock of the world! Shape… it’s all about cool designs and what you can do with them! 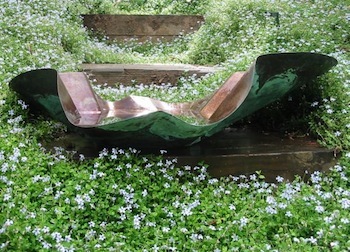 This aged copper free-form bowl is quite unique with its asymmetrical and flowing shape. A graceful form that imitates nature, it was just one of those “gotta have its”. Originally we set it up as a bird bath and added some blue and green sea glass for a nice contrast with the flamed copper interior. The chunky pieces also help trap sediments at the bath’s bottom, and provide safer footing for birds. 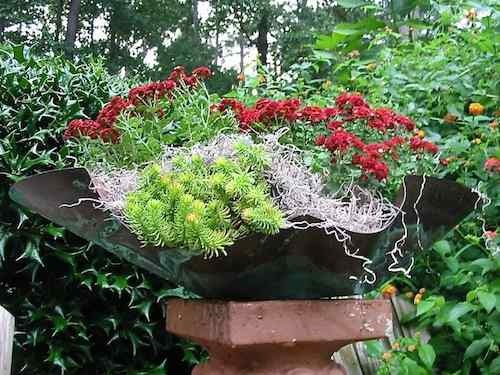 Recalling at the Atlanta show, the bowl was actually shown as a planter, so we billed it birdbath & planter. It was displayed with succulents and sheet moss, but almost any plants work. A bit of Spanish moss lends itself nicely to the design as well. 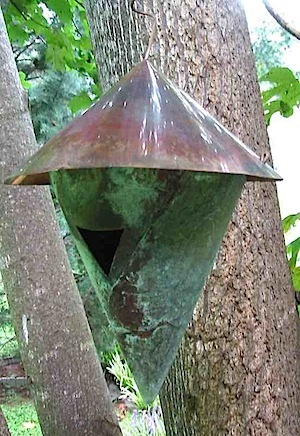 Oh yeah, and check the copper birdhouse to round out the set. 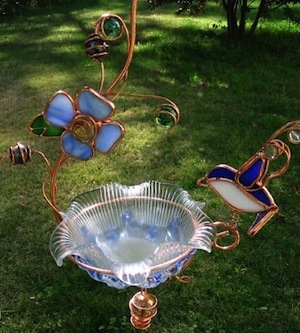 Functional art for the garden, this birdbath & planter makes for a most unusual focal point. The bird home also provides a great roosting spot during the off season. And since October is already here, be sure to clean out all old nests in your birdhouses at home. Easiest way is using a plastic grocery bag (make sure there’s no holes), reach in and grab the nest, turn the bag inside-out so you never touch the nest. Discard in the trash, away from the birdhouse as the nest will draw predators. These shelters may be used by other birds for roosting as colder weather approaches. And by all means, don’t give up on your birdbath either when temperatures drop. Birds require fresh water especially in winter-when many of their natural sources tend to freeze. Consider adding a heater to your bath and watch feathered friends flock to your yard, even on the dreariest of winter days! No doubt about it, nasty old seed on the ground can attract some uninvited guests. It’s also an eyesore, as well as a moldy bacteria-breeding ground for wild birds. 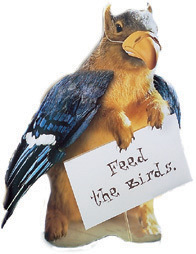 Kind of sad when folks give up on feeding beaked buddies because rats have entered the picture. Good news is that it doesn’t have to be this way! Several options provide for cleaner feeding areas, with little to no ground mess at all. It’s healthier for your local birds too. Start by using a no-waste seed mix, or sunflower hearts. You can bet every morsel will be devoured with no “picking through” and discarding the filler seed – which is usually what ends up on the ground anyway. If your big bag of cheap birdseed was a bargain… think again. Suet is a fantastic idea for a no-mess food choice… none of this will end up on the ground. You can even make your own with some fairly simple ingredients, and it’s perfect for cool weather and winter feeding because of high protein and fat content. The extra calories help birds stay warm by providing an energy boost! 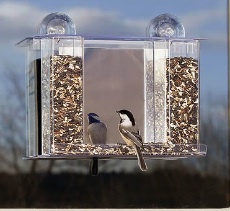 Adding bird seed trays or seed catchers below your feeders also deters unwanted ground visitors. Adjustable styles like the Seed Hoop fit practically any feeder out there! 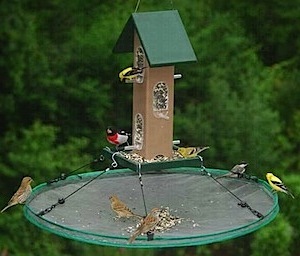 The large 30-inch diameter model can even be pole mounted, meaning that if your feeder sits on a pole, the seed tray can go right over it to nestle below the feeder. Just cut a slit in the center and slide the tray right over said pole. One bit of advice for this installation: Add some duct tape around the slit. Over the years that center slit has enlarged itself on our seed tray, simply from removing and replacing it for cleaning. 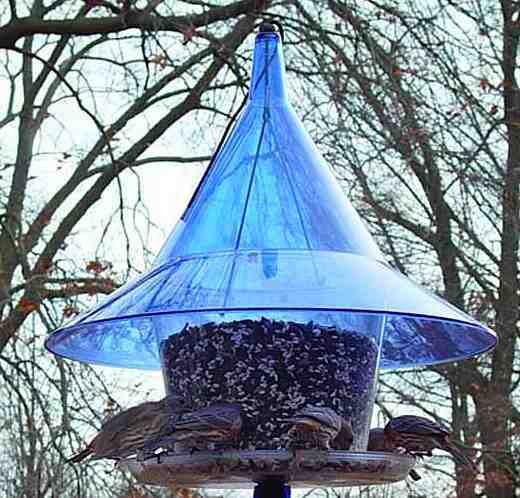 These are an awesome alternative for keeping ground areas below feeders clean. And as added bonus, the large platform may also attract some new feathered friends who’ve never used your feeders before. Try one and see who visits… no need to give up on your birds!